This 12 volt raft pump unit blows a slightly higher volume of air than our Bravo MB80 inflator, at about double the output pressure - 1.5 p.s.i. to 1.8 p.s.i. depending on your raft's valves. This means you won't have to do much topping off at all. There are a couple other inflators that do as well pressure-wise, and blow even more air., but they have not shown to be quite as reliable over the years. This pump stands up by itself, and comes with four adapters, including one that seems to work for about 80% of the valves out there. The raft pump hose is a bit too short for many applications. Your local hardware store sells various (spa & Tygon) tubing by the foot in the rope & chain section, so you can retrofit the Hurricane with something longer if you wish. A 5' piece of garden hose also works well. 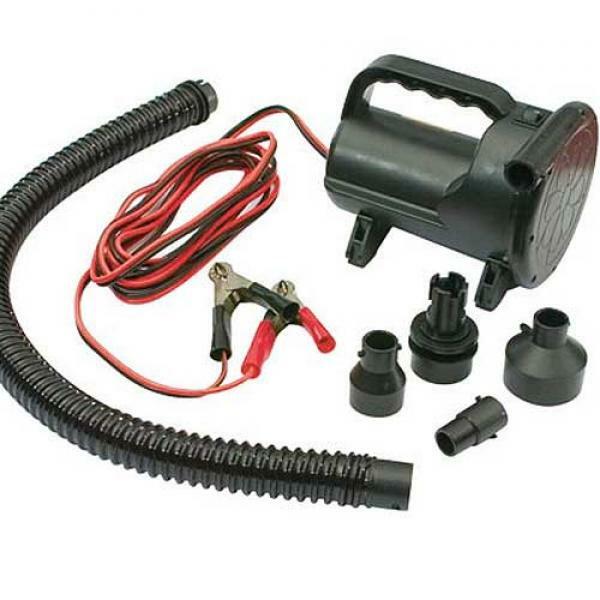 The Hurricane uses battery connectors for under your hood, not a cigarette lighter plug like the little Dyna raft pump.